A few years ago, Facebook rolled out functionality to all users that lets us hide advertisements we find objectionable. Many ignore this “I don’t want to see this” feature, hiding in the down arrow at the top right corner of the ad, because hidden advertisements are quickly replaced with new ones. Some do click and give their reason for reporting ads, however, giving Facebook a wealth of data about which ones users find objectionable. Now, Facebook has taken to its official Newsroom blog to explain how the site now uses that feedback to making your experience on the social network better. This change means Facebook is collecting more data on you, but in this case, it may be a good thing. 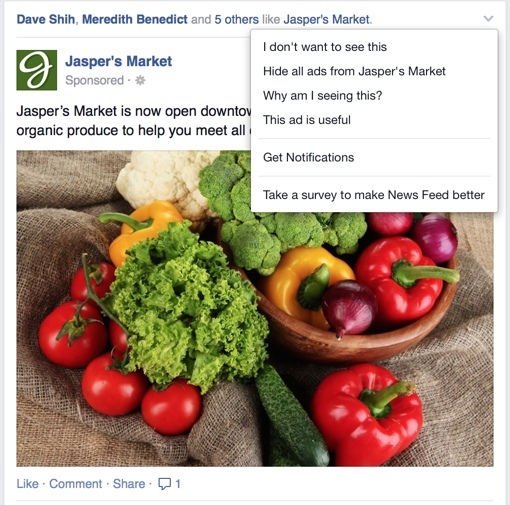 Each time you report an ad, Facebook also learns about the type of ads you, specifically, dislike. Once your ad profile is built, Facebook will intentionally avoid showing you ads it thinks “there is even a small chance” you might hide. The company says this change has already reduced the rate at which people hide ads by 30%. Of course, this is only the latest “advertising innovation” to hit the social network. Last year, Techlicious revealed how Facebook algorithms stretch well beyond the boundaries of the site itself, collecting data on you even as you shop in supermarkets. And the site landed in hot water last year when it asserted the right to feature everyday users of the site, including minors and their photos, as unpaid endorsers in ads on the site. This “advertising innovation” is just one more case of Facebook using data collected from me to “improve” my Facebook experience. What if I don’t want them to do this? It seems as if I have no choice in the matter. I am a web programmer, and I want to view Facebook as OTHERS see it. This is just one more reason why I’m glad that I deleted my original Facebook account years ago. I now use only aliases.